If you aren’t already familiar with the work of underground L.A. based producer Knxwledge, you owe it to yourself to change that. Coming out of the notorious hip-hop scene centered around Los Angeles’ Low End Theory club, a scene that has spawned artists such as Flying Lotus, Jonwayne, Mndsgn, Ras G, and Zeroh, Knxwledge has always managed to make himself stand out from the crowd, not only for his utterly unique, virtuosic style of beat-making, but also for getting production spots on a couple of the most high profile hip-hop releases of the decade. Most notably, he produced the track “Killuminati” off of Joey Badass’ debut mixtape 1999 and the track “Momma” off of Kendrick Lamar’s To Pimp a Butterfly. I first became aware of Knxwledge and his work back in 2012 when I heard his track on 1999. Although I loved the track he produced and took note of his name in the tracklist, I didn’t really dig deep into his solo output until a friend of mine put me on to Hexual Sealings LP, a project which he released in 2011. The album, like much of his solo work, is comprised of a series of instrumentals, some left to themselves and some paired with a capellas of other rappers and singers. This album boasts some incredible tracks, with remixes of songs by Jay-Z, Andre 3000 and J Dilla. It’s a short, but powerful piece of work, and it quickly became one of my favorite hip-hop albums of the last few years. This led me to explore the rest of his bandcamp – which already has over 60 of his beat tapes – and to become enamored with his instantly recognizable style, a style which is almost a genre unto itself. I soon learned that he had signed to Stones Throw Records, the acclaimed Los Angeles based underground hip-hop label that churned out a series of universally acclaimed classics throughout the early and mid 2000s. I began readily anticipating his first Stones Throw release, first when I heard about his upcoming collaboration with singer Anderson Paak, NxWorries, that is set to release an album this summer, and then when Stones Throw announced his first solo project to be released on the label, Hud Dreems. Now, only a few weeks after its announcement, Hud Dreems is here, and although it doesn’t subvert expectations and bring as many surprises as I think his album with Anderson Paak will, Hud Dreems is everything you could want from a Knxwledge release, and everything we’ve come to know and love from the prolific and enigmatic producer. The album presents itself as a beautiful and well-curated set of instrumentals; a collage of soul, jazz, and hip-hop where each beat flows seamlessly into the next. Knxwledge has a talent for being truly eclectic with his samples, on cuts such as “time&tide” and “noflowrs”, he can be found beautifully cutting up sounds of vibraphones and flutes, whereas on “tkekareofit” he goes for the sounds of some soulful horns, and what seems like a sample from some trap music (maybe Chief Keef judging by the sound of the voice) playing ever so quietly in the background. You can find little subtleties like this on every track on this album, which is part of what makes it such a rewarding listen. However, this isn’t the kind of project where you linger on any one song too much. Coming in with 26 tracks at just under 40 minutes, Hud Dreems is the kind of project that you just want to let yourself listen through in one sitting. Drifting through the tracklist, the short, typically under two minute long tracks seem more like moments than fully fleshed out and individual songs, making Hud Dreems, and its unified, hazy, and lush sound add up to an experience greater than its individual parts. 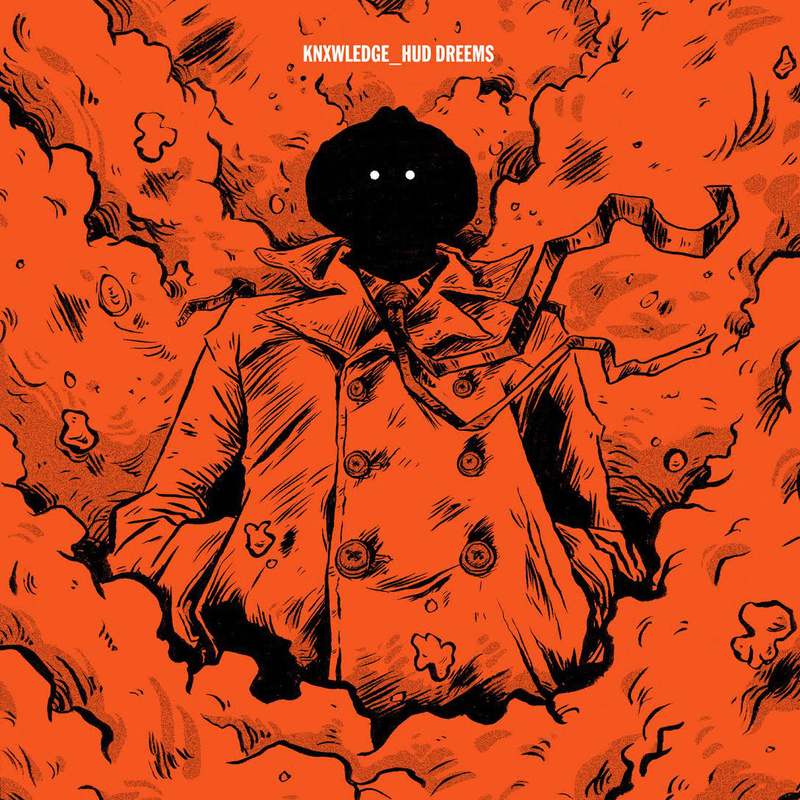 If you aren’t already familiar with Knxwledge, Hud Dreems is a great place to start, and if you have an interest in high-quality, abstract, underground hip-hop instrumentals, then Knxwledge is someone you need to be following. Like his predecessors such as J Dilla and Madlib, Knxwledge has already built up a massive catalog of material to dig into, and at the rate he’s going, he might end up being just as legendary and influential as those two. Stream and purchase Hud Dreems on Bandcamp and iTunes, and look out for NxWorries’ debut album later in the year.